Want to be notified of new releases in jllodra/cmod3? 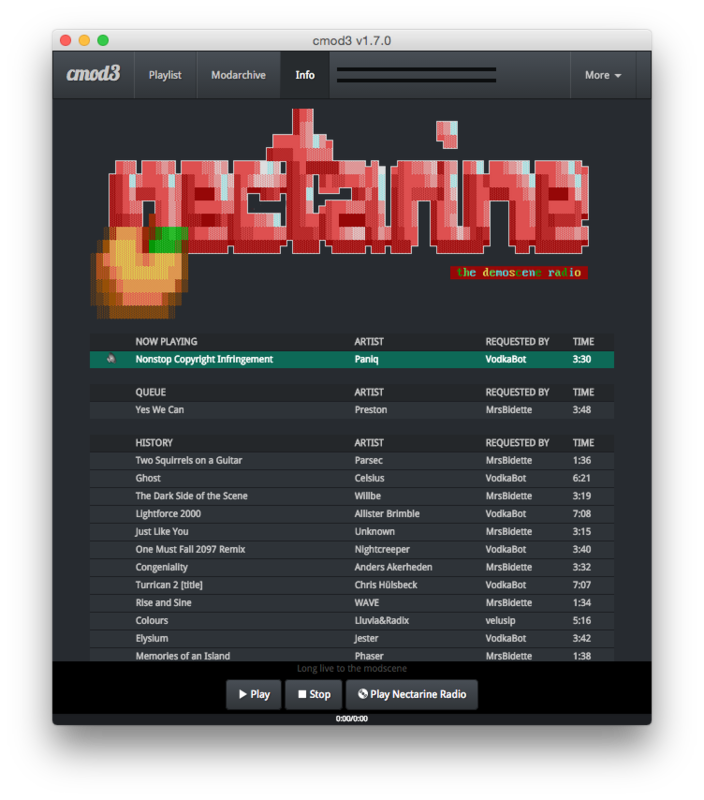 cmod3 is a module music player. Versions for Mac OSX x64, Windows x64, and Linux x64 available. Don't you know what tracked music is? Look here. Browse the Wiki for more information. Browse and download from Modarchive! Settings are not being saved yet. Keyboard shortcuts (1, 2, 3, 4, 5 and mediakeys). Volume control using a GainNode. Choose a Nectarine stream among a list of streams. Adding an AnalyserNode could enable VU meter for nectarine. Can you draw? An nice app icon is needed. Audio is being decoded on the main thread, which is not ideal, it should be done on a background worker/thread (not possible afaik, any idea? Audio Workers issue: https://bugs.chromium.org/p/chromium/issues/detail?id=469639). New ideas? Open an Issue. Contribute to the code via pull-requests and make this player better, or make a donation via paypal to jlg.hrtc@gmail.com, modarchive.org and scenemusic.net as well.